We love working with First Edition papers and the quality 200gsm cardstock makes them perfect for adding texture to this card project. 1. Cut out your heart templates and trace the shapes onto your chosen papers, cut them out and over the sink wet the papers, scrunch them into a ball and then flatten them out again. Leave to dry. 2. Cut two pieces of acetate 11 x 14.5cm, fold a piece of card 11 x 6 cm along the longest edge and use this as a hinge to stick the two acetate sheets together with double sided tape. 3. For the background cut two pieces of card 9 x 14cm, stick one on the inside back acetate flap, stick the other on the back of the card and use this for writing your message. 4. When your hearts are dry, layer and stick them all together, then fix to the front of your card. Finish your card by stamping your sentiment and using foam squares attach to the front of the card. 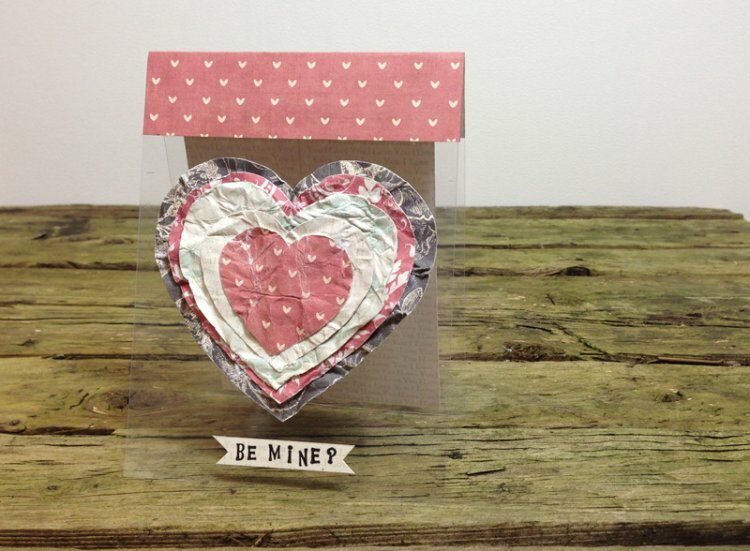 This Valentine’s card is really cute with the textured hearts and the transparent acetate; it’s a card any Valentine would be pleased to receive. If you like this project, leave us a comment below and share your own versions in our project gallery.